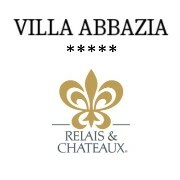 Hotel Villa Abbazia - Abbazia di Zanon Ivana & Co. The Relais & Chateaux Villa Abbazia, a masterpiece of harmony and refinement, maintains the charm of the past and makes the best balance between discretion and elegance to the hospitality reserved to those who love the pleasure of having a particular service, and reserved attentive. A Villa Abbazia every stay is unique! One of the most significant attractions of the Relais & Chateaux Villa Abbazia is the originality of the design. All our rooms are different and are characterized by the creativity of the environments and the classic definition of the interior, with attention to detail. In perfect balance between familiarity and intimacy, formality and friendliness, hospitality is the key that distinguishes the living style of the 18 rooms. For those who like to travel accompanied by their pets, no problem! We will be happy to reserve accommodation with direct access to the garden.